My goal when doing this page was to leave a lot of white space showing (something that is often hard for me to do!) I used gesso to whiten most of the page, left and right, and then applied some Distress ink through a stencil to get the brown polka dots. 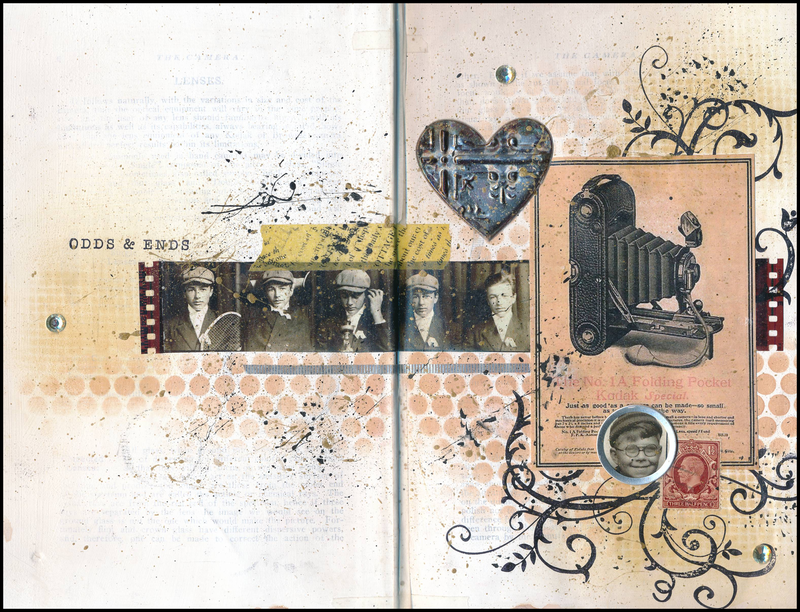 I used Archival ink to rubber stamp the black swirl pattern behind the images, and layered a variety of items (found images, vintage postage stamps, a metal heart, and the edges of some photography negatives). I used several kinds of washi tape, and three crystal blings. The words “odds & ends” are rub ons from the Tim Holtz collection. I splattered the page with some watered-down black acrylic paint applied with a toothbrush. I used a new toy on this page: the Tim Holtz tag press. I used a circle punch to punch out the little boy’s face, and the tag press to apply the silver frame around his image. A fun tool! On all of the pages in this art journal, I “waxed” the pages after they were complete. (This gives the pages a slight sheen, and also protects the pages from sticking together — something that can happen with the use of acrylic paints, gesso, and other sticky substances). To wax the pages, I rubbed each page with a white candle (purchased from the dollar store) as if it were a big crayon. I then buffed the page with a crumpled up nylon stocking. The results look and feel wonderful! I especially like how the wax evened out the matt and gloss products used throughout the book, giving things a more uniform look.